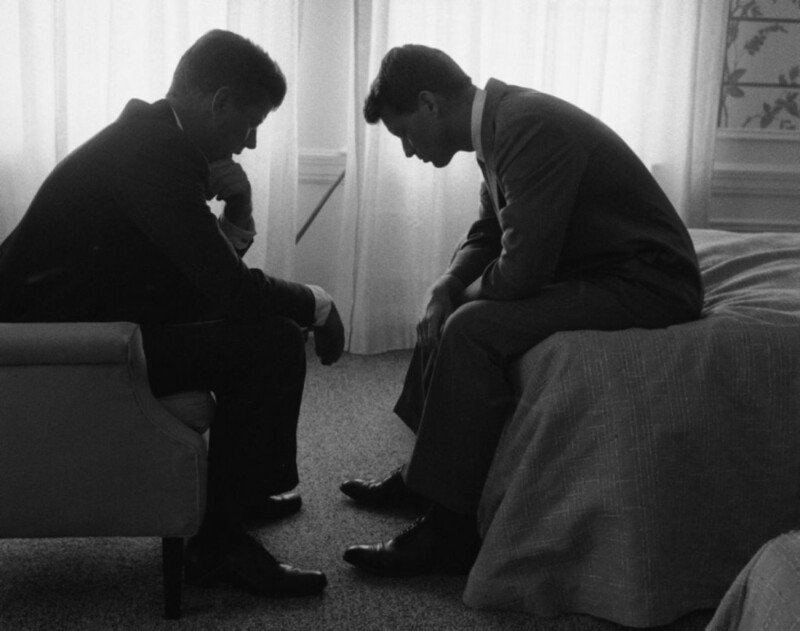 But I had actually heard the wrong story behind the iconic image of the Kennedy brothers. I was told that this was taken during the Cuban Missile Crisis. I found out it was taken much earlier, and honestly, I like the real story much better… which generally doesn’t happen too often. America loved JFK. He had a wife whom everyone adored, a beautiful little daughter, and a son on the way. People felt they could relate to him, and they trusted him to represent the general population, not just his own interests. His willingness to connect with the people could be seen very clearly in his method of campaigning. 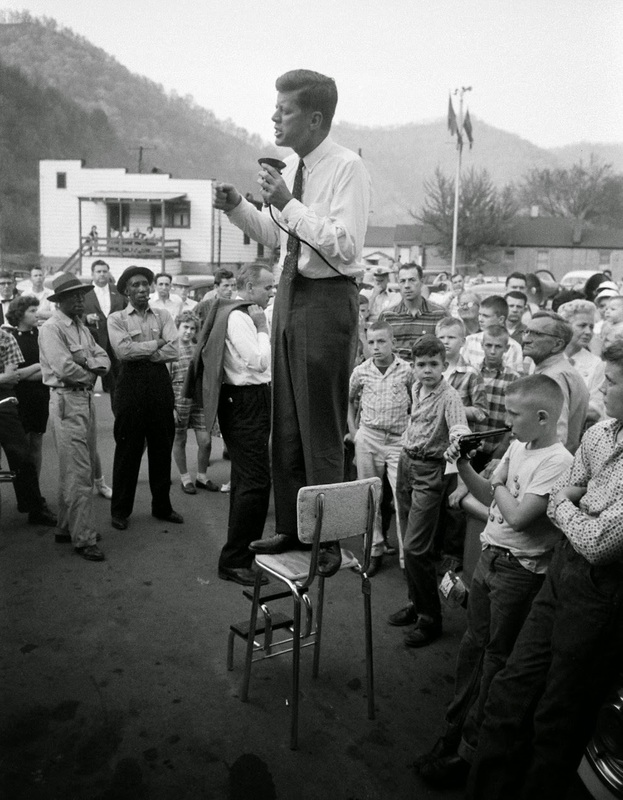 Here, in another photo by Hank Walker (who seemed to have as much of an interest in the Kennedys as I do), JFK is giving a speech to a small crowd in Logan County, West Virginia – a very, very rural area that wouldn’t get nearly this much attention today. Notice the boy on the right. Yes, he’s holding a gun. Another thing that would never happen in a presidential race today. Don’t worry; the kid isn’t crazy. “There’s a reason why the kid might have had the gun pointed at his own mouth. First of all, it’s not just an ordinary toy gun, but a squirt gun. Squirt guns existed before water bottles were commonly marketed, so the kid was drinking some water from his squirt gun, which was actually not a unheard of use of squirt guns, because, as stated, there were no water bottles.” The guns were made to look as real as possible until 1968, following the assassinations of (you guessed it) JFK, MLK, and RFK. JFK would go on to win the West Virginia primary (with 61% of the vote) and then become the Democratic nominee. Recounting the 1960 Democratic Convention, Walker described what was really going on in his iconic photo of the Kennedy brothers. With the help of Bobby, JFK defeated Nixon on November 8, 1960 in one of the closest presidential elections of the 20th Century. Kennedy led the popular vote by two-tenths of 1%, making him the second youngest elected president. I had no idea that RFK led JFKs campaign. It makes much more sense why he was attorney general now. The Kennedy brothers legacy is a sad one. While RFK probably wouldn’t have gone on to win the nomination when he ran in 1968 it was absolutely tragic that he was also assassinated. Having two, prominent and beloved people killed while trying to make a difference in the country is absolutely terrible. I completely agree with your obsession with the Kennedys though, they are so interesting! Due to the musical, Hamilton, I have a recent interest in history. I really enjoyed this story. JKF was such a sweet man- I wish I was alive during his presidency. I enjoy the real story more as well! Mainly because it begs the question, why does Robert Kennedy hate Lyndon B. Johnson? I loved your analysis of the photographs! You’d make a superb cinematographer, Hannah! Just some food for thought if you ever want to try a new career path ;). 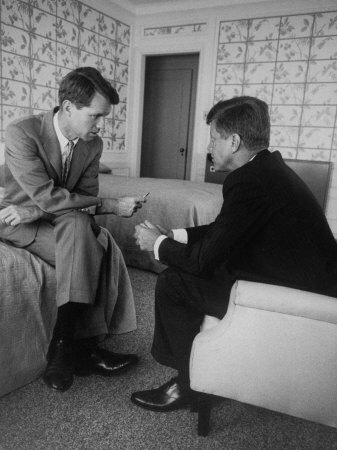 I really wish we could have lived through a full Kennedy presidency. He definitely had potential. Beautiful pictures as always! I really liked the use of the black and white photograph and that you finally used this photo in your blog. I was rather curious to why you had it as your screensaver. But seriously, if you keep updating then I’ll keep reading! The real story of this image is honestly great. I had always been under the impression that it was during a great national crisis as well, and to learn that it was something as comparatively trivial (comparatively is key here) almost makes me laugh. It’s a real shame what happened to both of the brothers though, and, according to the Kennedy Curse, anyone in the family, as you explained to me. They were good people, and it’s terrible that they both passed in the ways they did.